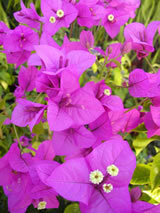 This climbing sub-tropical shrub is one of the showest plants. It climbs by means of its thorns which spring through to autumn develop into brilliant glowing magenta flowers.These flowers cover the plant for a long season. Planted on the sunny side of a fence, pergola, trellis or old tree if allowed willl completely cover the support. Great for creating a 'fedge', a hedge supported by a fence. Avoid frosty areas.